Zurinah Suradi is an Assistance Professor of Management Information Systems at College of Commerce and Business Administration, Dhofar University, Salalah. Her areas of experts include management of information systems, adoption/acceptance of information systems, information systems strategic planning, research methods, statistical analysis and data science. Zurinah’s research focuses on the adoption or acceptance of information systems like E-Learning and Electronic or Mobile Payment. Also, her research activities will include topics in business and management related. 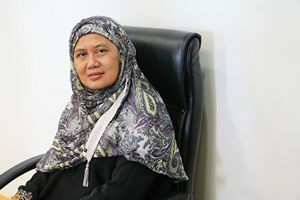 These are reflected in her recent publications: International brand vs. local brand: An evaluation of brand trust, brand reputation, customer satisfaction and purchase intention of Malaysian customers (2017), Review of Malaysian Payments System: Mobile and Electronic Payment(2016) and Empathy among students in engineering technology (2016). Recently, she just completed a research work on a feasibility project with Ministry of Education of Malaysia on Fully Privately Run Public School. Zurinah received bachelor degree in Mathematics and Computer Science from Oklahoma State University, USA. She received her Master of Science in Mathematics with option in Statistics from West Virginia University, USA. Finally, she earned her Doctor of Philosophy in Information Science from University of Strathclyde, UK. Started her teaching career as Graduate Teaching Assistance at West Virginia University. She had previously worked at several Malaysian universities. Information Strategic Planning, Information Systems/Technology Adoption/Acceptance, Knowledge Management, Research Method, Statistical Analysis, and Data Science. Teaching courses:Zurinah’s teaching experience at Dhofar University include teaching Business Information Technology which focuses more on the practical work on using word processing, spreadsheet and powerpoint for business requirement. At the end the course, students will have the intended skill to use the applications software to fulfill their learning needs in the university. For System Analysis and Design, the concentration is on.phases in systems development life cycle systems planning, analysis, design and implementation and operation. On the other hand, the Application Software and Web Development emphasis on the HTML5 coding for a website development. Students are required to do a project by building a website using the knowledge that they learned throughout the course.